Stretching for thousands of miles beneath oceans, optical fibers now connect every continent except for Antarctica. With less data loss and higher bandwidth, optical-fiber technology allows information to zip around the world, bringing pictures, video, and other data from every corner of the globe to your computer in a split second. But although optical fibers are increasingly replacing copper wires, carrying information via photons instead of electrons, today's computer technology still relies on electronic chips. Now, researchers led by engineers at the California Institute of Technology (Caltech) are paving the way for the next generation of computer-chip technology: photonic chips. 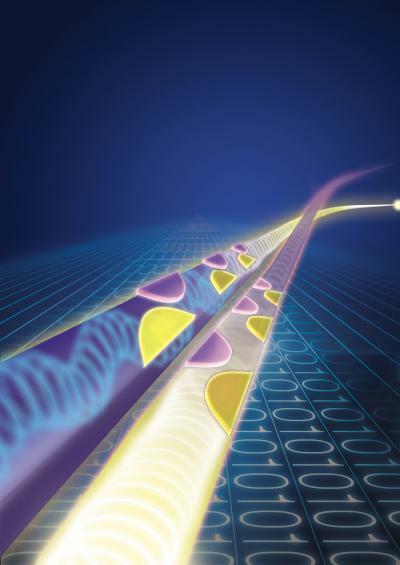 With integrated circuits that use light instead of electricity, photonic chips will allow for faster computers and less data loss when connected to the global fiber-optic network. Previously, there were two main ways to achieve this kind of optical isolation. The first way—developed almost a century ago—is to use a magnetic field. The magnetic field changes the polarization of light—the orientation of the light's electric-field lines—when it travels in the opposite direction, so that the light going one way can't interfere with the light going the other way. "The problem is, you can't put a large magnetic field next to a computer," Feng says. "It's not healthy." The second conventional method requires so-called nonlinear optical materials, which change light's frequency rather than its polarization. This technique was developed about 50 years ago, but is problematic because silicon, the material that's the basis for the integrated circuit, is a linear material. If computers were to use optical isolators made out of nonlinear materials, silicon would have to be replaced, which would require revamping all of computer technology. But with their new silicon waveguides, the researchers have become the first to isolate light with a linear material. Although this work is just a proof-of-principle experiment, the researchers are already building an optical isolator that can be integrated onto a silicon chip. An optical isolator is essential for building the integrated, nanoscale photonic devices and components that will enable future integrated information systems on a chip. Current, state-of-the-art photonic chips operate at 10 gigabits per second (Gbps)—hundreds of times the data-transfer rates of today's personal computers—with the next generation expected to soon hit 40 Gbps. But without built-in optical isolators, those chips are much simpler than their electronic counterparts and are not yet ready for the market. Optical isolators like those based on the researchers' designs will therefore be crucial for commercially viable photonic chips.